Menopause and the menstrual cycle are natural processes that don’t have to cause suffering in women. However, most women find the opposite to be true. Hormone health is inextricably connected to our stress level. Stress doesn’t have a quick fix and can only be improved with gentle but steady attention to our lifestyle. Menopause and the menstrual cycle are natural processes that don't have to cause suffering in women. However, most women find the opposite to be true. Hormone health is inextricably connected to our stress level. Stress doesn't have a quick fix and can only be improved with gentle but steady attention to our lifestyle. It's very important for women to create a self-caring attitude where they take time to nurture themselves and avoid wearing themselves out. Nothing is more important for your health than peace of mind. To be healthy there needs to be a balance between activity and rest. This difficulty with slowing down activity level relates to the psychological aspects of the liver and spleen energy systems. When these organs are balanced, we are people who get a lot of satisfaction from accomplishment as well as enjoy nurturing others and ourselves. But, when out of balance, we wear ourselves down, overdoing it in many aspects of our lives until there is nothing left. In order to improve our health, we must cultivate a deeper understanding of what our energy systems are in charge of and what factors influence their healthy functioning. Taking into account emotional and psychological effects and interpersonal relationships is especially helpful for creating a holistic approach to our wellness. TCM is a useful tool in understanding our health. TCM views the body as a network of interdependent energy systems called organ systems or elements. This theory is called the five elements theory. Each organ system has energy functions and affects us physically and emotionally and influences the relationships we have with others. Liver system includes the liver and gallbladder and their pairs of meridians. The liver energy's job is to keep the flow of energy within the body smooth and steady, sending out energy through the body when it is needed for action and storing it when it is time to rest. The liver is considered the action organ and its partner the gallbladder is the decision-making organ. The liver gives us the ability to make good decisions and take action on them easily. Liver personalities are decisive and busy people who get a lot done. They don't like obstacles in their way and tend to hit them head on instead of going around, winning their battles by power and irresistible force of will. In a balanced state, the liver personality is a straight shooter, emotionally steady and even, and profoundly productive with a drive to succeed. Anger is the emotion associated with the liver, but anger isn't a bad thing. The liver's nature is to take action. When action is restricted, then the liver wants us to push harder. Without anger people would just accept whatever situation was imposed on them. When the liver is healthy and balanced, this natural impulse to overcome obstacles quickly transforms from anger into action. But when out of balance, the liver person tends to get frustrated easily. They see everyone and everything as an opponent, thwarting them, and getting in their way. Others are too slow or stupid. Anger and resentments can build up. This buildup of emotional pressure can often cause people with liver imbalance to have emotional outbursts, crying or shouting. The emotional outbursts are just the body's way of trying to release some pressure. The nerves get jangled and over stimulated. People can feel shaky and anxious and overtired. Tired and wired are the two words that describe this best. They can become over-reactive to situations and snap easily at others. In relationships, the out of balance liver person can become demanding and aggressive and be difficult to communicate with, snapping instead when there needs to be a deeper meeting of the minds. They can be filled with resentments and bitterness and a lack of forgiveness. They can be disrespectful of other people's efforts, thinking that others are not doing enough, that they themselves have to do everything. They can overreact to the slightest offense. But if the liver system is healthy and balanced, the liver person is a big strength to a partnership, loving to do stuff, on the go, getting stuff done, honest and straightforward and extremely capable, and a powerhouse of productivity. They like to take on a lot of responsibility and enjoy doing a good job. They are graceful and balanced physically and emotionally. Physical liver symptoms can be cardiovascular disease, high blood pressure, high cholesterol, autoimmune issues, depression, thyroid problems, gallbladder problems, headaches, especially migraines, itchy or red skin, constipation, allergies, muscle cramping or twitching, and eye problems. All abnormal cell growth like tumors, fibroids, and cysts is a sign the liver energy is stagnant, especially when these problems are in the sexual organs for either men or women. All problems that relate to irregularities with the hormones are related to liver system problems. For instance PMS, or menopause issues, like mood swings, anxiety, feelings of anger and frustration, irritability and over sensitivity, depression from stress, heavy bleeding, irregular cycles, missing periods, bad cramping, nausea with your cycle, headaches with your cycle, changes in appetite with your cycle, and irregular heart beat with your cycle. When both the spleen and liver are severely out of balance, women can get more serious symptoms like endometriosis and chronic pelvic pain and inflammation, pelvic congestion syndrome, and autoimmune problems. Next is the spleen system, which includes the spleen and stomach and their pairs of meridians. The pancreas is part of this system and is seen as part of the spleen energetically. The spleen's energy job is the assimilation of food and information, absorbing both and incorporating them into the body. The spleen personality is very centered and grounded. They are steady and strong and don't get flustered easily. They are naturally nurturing and would really enjoy preparing food for themselves and others, making sure everyone had their favorite things to eat. They understand and absorb information deeply. The spleen is very much affected by stress. I mentioned earlier that the Spleen was responsible for assimilating information. When a person is worried, they often spend a lot of time thinking about situations, trying to problem solve them and figure stuff out. This causes the spleen to energetically overload in its ability to absorb information. The more you try to problem-solve the same situation, the more the spleen gets out of balance and it becomes hard to stop thinking about a problem. Thinking can become slow, foggy, and obsessive. Emotionally, when the spleen is out of balance, people tend to feel overwhelmed. It just feels like there is too much to process or too much to think about, too much worry. People also will feel a sense of being stuck. You might find yourself saying, I feel so stuck in this job, or this relationship, this house. You might even feel that something is physically stuck in the abdominal area. In relationships an out of balance spleen person will tend to be overly care-taking of their partner, doing too much for them and neglecting themselves in the process. Nurturing is not the same as care taking. The natural nurturing tendencies of a spleen person become exaggerated and you end up forcing onto others food and other misguided actions that you think are helping them. It may be difficult to stop helping others even when you know it is wearing yourself out and just annoying them. But, when the spleen is balanced, the person brings stability to a relationship, a steadiness and groundedness. The balanced spleen personality is a blessing to have in a home environment, creating a home out of the place you live, offering nourishment and support with an awareness of the other person wanting that support, and keeping a good balance on nurturing oneself as well. 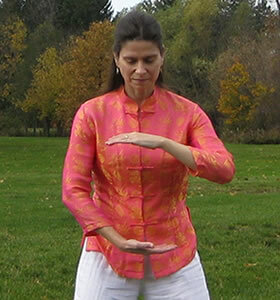 The following exercise is from the abdomen set of Health Balance Qigong and can be found in the Qigong for Women DVD (published by YMAA). This exercise improves Qi flow through the entire abdomen. 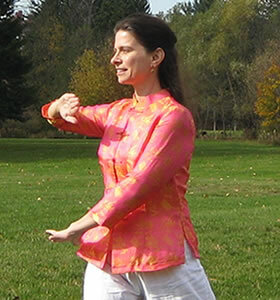 A little bit of Qigong exercise daily can greatly improve your health and wellness. Exhale as bend both knees and round spine palms facing each other like hold ball with left hand on top above heart and right hand at waist. Inhale and twist waist to right, bend right elbow and point up and toward back wall with right palm facing away from body as push left palm down in front of right hip as roll upright from knees up. As you roll upright, weight shifts to right leg, right knee bent with kneecap pointing to front wall. The left leg straightens and relaxes completely. On this first inhale (when right hand up), visualize environmental energy flowing with a green color into the right liver and gallbladder Mu points located below the breast in the spaces between the ribs. Mu points are acupuncture points that allow energy to balance the internal organs. Inhale a second time and visualize even more energy coming into the liver and gallbladder. On the second exhale bend both knees and round spine as rotate body back to center and hold ball with right hand on top and left hand at waist, palms facing each other. Repeat twist to left side as you inhale. On this inhale with the left hand up, visualize environmental energy flowing with a yellow color into the left Spleen Mu point located at the end of the second to last floating rib and the Stomach Mu point right in front of the stomach. Exhale and inhale a second time and bring more energy into the spleen and stomach. On the next exhale, bend both knees and round spine as rotate body back to center to beginning position holding ball with left hand on top. Make sure when you twist to the side that you bend the weight bearing knee and keep the knee cap pointing forward. Don't twist the knee as you turn the waist. You should feel a comfortable stretch in the weight-bearing hip. Completely relax the opposite leg as you straighten it. Repeat this exercise as many times in a row as feels comfortable and repeat three times per day to reduce stress and improve energy circulation through the abdomen.